Ed Note: This post is part of the Friday Footnotes, a series dedicated to sharing the thoughts, stories, and meditations on life as part of the trail running community. If my experience with ultramarathons has taught me one thing, it’s that a crew has a direct connection to how well the race will go. I’ve run ultras by myself with no crew at all, with a one man crew, and with a full on support crew, and through each of those experiences I learned that the better the crew, the better I run. So when planning for my first 100 miler, the Massanutten Mountain Trails 100, earlier this year, I wanted to assemble the best crew possible. And I wanted them to run more like a NASCAR pit-crew than a casual cheer section. When thinking of who might make up this crew of superstars, who better to ask than my family? My wife, mother, father, and step-mother. I knew they would do everything in their power to keep me healthy and happy. They’d support me through the low points, be excited through the high points, and not quit if I got mad at them for no reason. They’d make the perfect crew. The only problem was that none of them had crewed, or even attended, a 100 mile ultramarathon. It’d be just as big of a learning experience for them as it was for me. But I knew they were up for the challenge. Today I have a special treat for you. A post written by my mother! 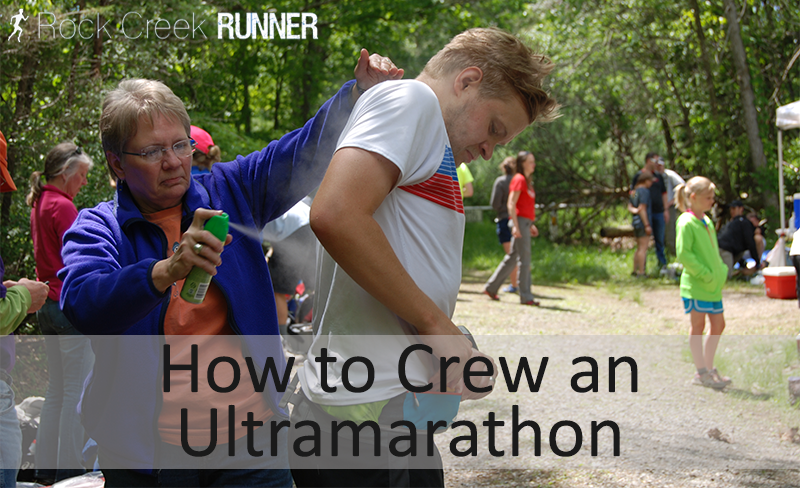 She shares the lessons and tips she learned on how to properly crew an ultramarathon. Side note: She calls me “Douglass” throughout the post instead of Doug. You know, because she’s my mother. It started with high school cross country meets. Over the years the chasing and cheering have become more complex as Douglass graduated to marathons, 30 milers, 50 milers, and just recently his first 100 mile trail race. I’ve rung many a cow bell and waved dozens of bright signs along race routes, but nothing quite prepared me for being on his crew team for the 100 miler! Crewing at the Massanutten Mountain Trails 100 involved both doing the work of the team and observing how other crew teams functioned. After all, our crew had to admit that we were novices and open to learning from the pros. 1) Preparation is priority: In our case, our runner took firm control of preparation, with his wife, Katie, right alongside. Douglass prepared detailed lists (gear, nutrition) of everything he could possibly need or want during the run and Katie did the same for what the crew would need. A cue sheet for every aid station where we would meet Douglass, complete with details about what food, clothing and gear to have ready; when to change out his shoes and charge the GPS and when to have the headlamps ready. Most important it had the mileage to the next aid station so we could remind Douglass what to expect over the next leg of the race. A set of driving instructions, provided by the race, for the crew to follow getting to each aid station. 2) The car is key: For Douglass’ 100 miler, the crew was dependent on my car for over 32 hours. It was our kitchen, living room and bedroom! Thanks to Katie, all the food and gear fit perfectly in the trunk, including the plastic tubs, cooler, blankets for quick naps and the critical folding camp chairs for use while we waited at each aid station. The car was fully fueled and ready for our crew of four when we saw Douglass off at the 4:00 AM start. 3) Make it a family affair: As Douglass’ mom, I was honored to be included on the crew, along with Douglass’ wife, dad and step-mom. We saw families of all shapes and sizes along the race route. There was a mother with two not-yet-school-age children who ran enthusiastically to greet their Dad at every stop and then hung onto his legs in happy bliss. There was a husband who dutifully prepared for his wife while also minding the runner’s elderly mother who never left his side. And then there was the “family” of Virginia Happy Trails Running Club who cheered on a number of their own members and later served as pacers throughout the night. Whatever your family looks like, being on a crew team brings you together around a common goal. And the best part is that the goal is never about you. 4) It’s all about your runner: Let’s be realistic. Everything about serving on a crew is not fun and games, but because you are completely focused on the needs of your runner, there’s no time to think about yourself. This was especially true for our crew at the midnight aid station, 20 hours into the race. In addition to spreading out our own array of items according to Douglass’ instructions, we scoped out all that the official aid station had to offer, before Douglass arrived. While the crew was beginning to feel tired at this stop, our fatigue couldn’t begin to compare to Douglass’. He arrived hungry and hurting, having developed blisters on both feet. But because we knew all that was available, we were able to get medical attention for his feet and great vegan chili for his stomach. We had done our job well! everything that he ate, drank and needed while he was there. We made note of his stories about each leg – what was challenging (when it got super cold just before daybreak on the second morning) and what was exhilarating (when he realized at mile 78 he only had a marathon left to run). The stats allowed us to figure his minutes/mile and how much time he was spending at the stops. He was later able to tally all of his intake for the race…and output too for that matter! 6) Have fun and be in the moment: One of my favorite moments of the race was seeing the aid station at mile 78 at around 4:00 AM. We had had just a half hour nap over the past 24+ hours and this station was the perfect antidote to sleep deprivation. There was a roaring bon fire, strings of little lights lining the trees and huge inflatable Halloween figures. Douglass enjoyed it so much he wanted to run right through the giant spider! If I was to change one thing about my experience as a crew member, I might have interjected a few more unexpected surprises like this along the route. So watch out, Douglass, on your next 100 miler your crew might appear dressed as pirates, cowpokes or prostitutes….you just never know! What a wonderful mama and family you have! I am dying to run an ultra! Hopefully I will get brave enough soon.